MANILA, Philippines - The full results of March 2018 Civil Service Exam - Paper and Pencil Test (CSE-PPT) also known as Career service examination are available online as released in 59 days after the exam (May 16). The Civil Service Commission (CSC) announced those who have hurdled the professional level and sub-professional level examinations. The first CS exam this year was conducted on March 18 in all regions nationwide. All examinees, passed or failed, may get their individual test results using the Online Civil Service Examination Result Generation System (OCSERGS), which can also be accessed on the CSC website (www.csc.gov.ph). 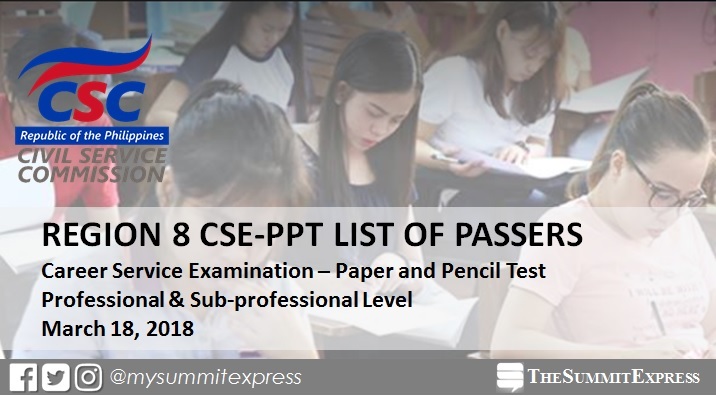 Aside from civil service eligibility and education, CSC clarified that CSE-PPT passers must also meet the other basic requirements of experience and training for permanent appointment to a government career service position. Moreover, applicants to government posts may undergo an internal screening process by the agency’s Personnel Selection Board, which may be composed of written tests, interviews, and other processes to determine the most qualified candidate for a vacant position.